Russian born painter, graphic artist and designer Sonia Terk Delaunay was active in Paris and the wife of painter Robert Delaunay. Her original surname was Stern, but she adopted the name Terk from a wealthy uncle who raised her in St. Petersburg. A friend of the family, Max Liebermann encouraged her to paint. Like Marc Chagall, Sonia Terk emigrated from Russia to Paris in the first years of the twentieth century, joining Picasso, Matisse, Braque, Rouault, and Vlaminck in the remaking of art in the Post-Impressionist era. She settled in Paris in 1905 and, after a short-lived marriage of convenience to artist Wilhelm Uhde, she married Robert Delaunay in 1910. The couple became associated with the development of Orphism*—a highly abstract art movement which paralleled the geometry of Cubism* but with a much brighter color palette. Sonia’s first large scale painting in this new style was Bal Bullier (1912-13) a work known for its use of color and movement. It is said that painter Paul Klee was so taken with Terk-Delaunays’ patterning of squares from a 1912 illustrated book, that they became an enduring in his own work. During the 1910-1920s, she focused upon bringing this new artistic lyricism into the world of design, transforming Art Deco* fabrics into vibrant high fashion clothing, wall coverings, furniture textiles, as well as, theatrical costumes. In the 1930s, Terk-Delaunay returned to a renewed focus on painting, joining the Abstraction-Creation group in seeking to create an art based upon non-representational elements, often geometrical, and continuing to focus on color as central to painting. The group was trans-national, and including among its members Jean Arp, Barbara Hepworth, Wassily Kandinsky and Piet Mondrian. In 1937 Sonia collaborated with her husband on a mural for the Paris Exposition. After Robert Delaunay’s death in 1941, she continued to work and exhibit regularly as a painter & designer, often turning to printmaking. In 1963 Terk-Delaunay donated 58 of her own works and 40 of her husband’s to the Musee National d’Art Moderne, Paris. She became the first woman ever to be exhibited at the Louvre during her lifetime when the museum mounted an exhibition of the works the following year. 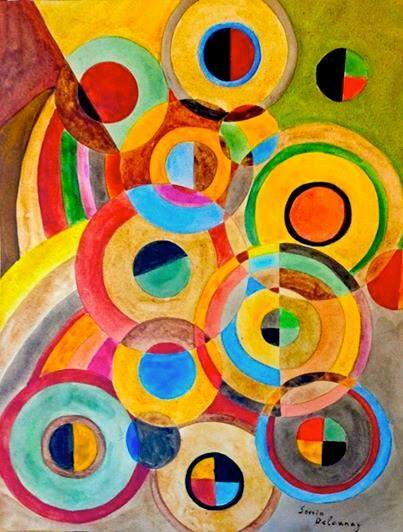 Sonia Terk-Delaunay died in 1979 at the age of 94 with no regrets in her life. “Everything I’ve done, I’ve had fun doing” she remarked on the occasion of her 90th birthday.